Swedish studio Fatshark, previously known for titles such as War of The Roses, War of The Vikings and Krater, announced today that they are working on a new title set in the Warhammer universe. In a post on the PlayStation blog executive producer Martin Wahlund talks a bit about the upcoming title. 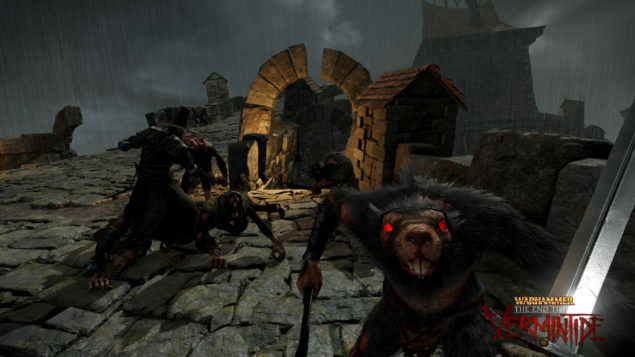 Vermintide is a co-operative First person action game with both shooter and melee aspects of gameplay, much like Left 4 Dead. The major difference from Left 4 Dead would be that you are 5 players instead of 4, you choose a “Hero” each featuring different abilities and favoring different gear and play-styles.The players must work cooperatively to survive the apocalyptic Skaven invasion in the city of Ubersreik. Vermintide is currently due out for PC, PlayStation 4 and Xbox One during the second half of 2015.